Eric Berggren was born on November 15, 1886 in Hamilton County, Nebraska. After attending a public school, Berggren went to Utah to work for the Union Pacific. For a short time he worked for the railroad and then returned to Nebraska to begin farming. Upon his retirement in 1944, Berggren and his sister Frances, with whom he lived began to pursue intellectual interests. They traveled extensively throughout the United States and Mexico, and lived in some Scandinavian countries. 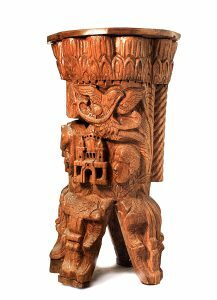 Berggren’s carvings, therefore, are highly influenced by the ancestral traditions of Scandinavian folk art. While his work was created to be utilitarian, the folk aesthetic is highly accomplished. Carved on American elm, the pieces are narrative, and borrow from many archetypal classical, mythological, and legendary stories. Figures in Berggren’s work focus on design and a humble attempt at realism. The dynamic nature of Berggren’s sculptures may encourage a redefinition of the traditional notion of folk art.